Ten club members braved the elements and met at 9am at Southgate Car Park with great enthusiasm and anticipation as to what our leader Mr. Tony Llewellyn had in store for us. The weather at this time looked as if it was not going to be very kind, but luckily things improved very quickly and we eventually had clear skies. Those present were Marie, Jeff, Ellis, Richard and Gordon together with Tony Platt, Ben Wiles, Cheryl and Sian Sullivan and of course our leader Tony. After a group photograph we set off towards Three Cliffs across the grassed cliff tops with several areas available to catch the outgoing tide and surf against the rugged rocks below us. The sky and light was not generally good but you have to take what you get in these conditions. We were soon faced with a tricky area of terrain to negotiate which was to test the fitness of all, a steep descent into Pobbles Beach with the equally steep ascent ‘tother side, this enabled us to reach our just reward – an absolutely outstanding view above the three peaks of the bay together with the receeding surf. This view of course has been photographed by many, but to actually be there and made the effort to reach this spot made the reward something to remember for a long time. A leisurely walk through the dunes admiring the valley below brought us to Pennard Castle. After all taking shots from all angles, our leader took a photo of all present. At this juncture four of the party decided to work their way back to the warmth of the tearoom and sit out the remainder of the morning. The remaining six wanted more and Tony led the descent to the valley below and on to Three Cliffs beach – our aim was to pass through the ‘tunnel’ in the cliffs and commence our return to base via Pobbles Beach. Unfortunately, once through the tunnel access was not possible without waders or such suitable attire. At this juncture your scribe decided enough was enough and made the decision it was wiser with his state of fitness to commence his return to base as the other five decided to walk along the beach and over the stepping stones in the hope of finding that special shot. Their journey from there on is best described by ‘little Sian’ quoting her Facebook description “we scaled dunes, slid down them on our bottoms, climbed rocks and waded rivers. I got home totally exhausted with wet feet like prunes, but boy was it worth it !! The weather was superb and the company jovial. A good time was had by all and i even think we had some tidy shots too !! Everyone had arrived back at the car park by 1 o’clock relating their different experiences. Five of the party decided to return home, but I along with the other four decided that ‘The Hungry Horse’ in Killay served up a superb Jumbo Cod, mushey peas and chips, this together with a pint of Worthington Creamflow was the appropriate way to end our days experience. 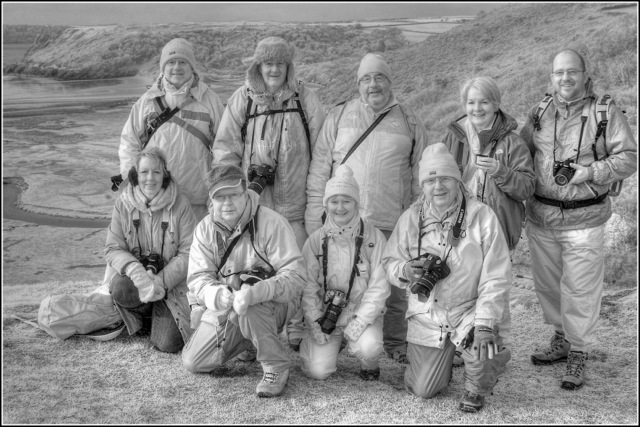 Well Done Tony Llewellyn, all who attended thouroughly enjoyed the day and we look forward to the next trip to Dunraven Bay on 23rd February. This of course will be a far more leisurely affair. Richard Walters – Field Trip Co-ordinator.